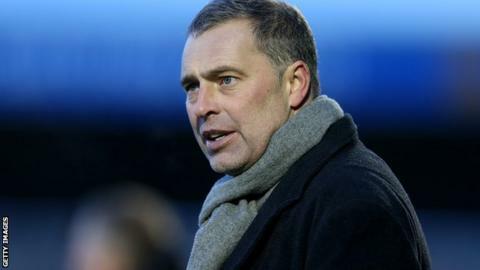 Dagenham & Redbridge manager Wayne Burnett has signed a new two-year deal with the League Two club. The 43-year-old has been in charge of the Daggers since February 2013 and he led the side to safety that season. The east London club finished ninth in the table in 2013-14 and are set for another mid-table finish this term. "I'm delighted that we have secured the services of the only man we considered for the job," Daggers chairman Dave Bennett told the club website. Former Huddersfield and Grimsby midfielder Burnett initially took charge of the Daggers on an interim basis after John Still joined Luton. Burnett, who joined Dagenham's coaching set-up in 2009, was handed a permanent deal in the summer of 2013. His new contract will run until the summer of 2017, which would mark the 10-year anniversary of Dagenham's promotion to the Football League. "Hopefully next year he will take us forward and onto our tenth season in the Football League," Bennett added.